There are a lot of different Tools in the game – some good, some bad, and some surprisingly inspired by a number of effects spawned from one or two. At least that’s the impression I get after I read a card like Expert Belt being present before anything in the BW era. Expert Belt is a simple Tool that adds 20 HP, lets you do 20 more damage with the equipped Pokemon’s attacks, and if your opponent KOs the Pokemon, they take 1 more Prize card. For the time frame in which it came out, some of the highest HP that a Pokemon could have hung around 140, so this Tool would make them just about even with most modern Stage 2 non-EX/GX Pokemon. You can see where the extra effects would’ve gone – an extra Prize became more of a rule for EX/GX, the additional 20 damage got transferred over to Muscle Band, and the extra 20 HP would eventually show up on Giant Cape. For its time frame, I can imagine Expert Belt having a more strategic play style. Playing it all willy-nilly, you could risk putting it out only to have the Pokemon it’s attached to get KO’d, and then you lose 2 Prizes easy. You wouldn’t put a Pokemon-EX/GX on the board without Energy, right? Well same general principle, except now you’re transforming a Pokemon into an EX/GX. Sure, conceptually it’s leagues different, but the philosophy of it remains the same – there’s a timing to Expert Belt, you wouldn’t just be attaching it willy-nilly to anything like a Muscle Band or Choice Band. It takes some good timing, so keep that in mind. That being said, Expert Belt likely would’ve seen a lot of play – I’d certainly have played it for the extra 20 HP and 20 damage even with the Prize requisite. It’s something to ultimately consider with this card if you ever build a deck around it. Thankfully, it’s unlikely to ever show up in Standard, cause the last thing we need are 270 HP Pokemon that can wipe anything out and only risk 3 Prizes. Arora Notealus: Expert Belt being what would be a combination of future Tools is interesting. I wonder if there are other Tools that could be conceptualized as a result. Something like Float Stone and Giant Cape could be interesting, or maybe multi-Type Memories for Silvally-GX. Just seems like a neat idea! Next Time: We’ve gone through time, so let’s cover some space! Today’s Throwback Thursdays is Expert Belt from Platinum Arceus. It is another favorite item that I used to love using, though not so much now even if I could use anything. This card was reviewed by the Pojo crew twice, December 16, 2009 (https://www.pojo.com/COTD/2009/Dec/16.shtml) as a regular review and January 7, 2010 as the 7th best card of 2009 (https://www.pojo.com/COTD/2010/Jan/7.shtml). This is a Pokémon Tool card which grants the holder 20+ HP and letting that Pokémon deal 20 more damage to your opponent’s Active Pokemon. The caveat would be that if the Pokemon this tool is attached to is Knocked Out, your opponent takes one more prize card. This was a great card back then, due to most Pokemon being worth a single prize from DP-on format. The few Pokemon that were worth two prizes were Pokemon Legend: Raikou & Suicune Legend, Entei & Suicune Legend, Entei & Raikou Legend, Deoxys & Rayquaza Legend, Groudon & Kyogre Legend, Dialga & Palkia Legend, and Darkrai & Cresselia Legend. I have not recalled seeing a Pokémon Legend with an Expert Belt attached to it, but if it were to be Knocked Out, then your opponent will take three prize cards! Anyhow, Expert Belt helped reached important numbers for certain OHKOs or 2HKOs while the extra 20 HP can help survive an attack that would otherwise KO that Pokemon. However, this isn’t a card that you slap into any Pokemon and expect to win. It would be mostly Pokemon with high HP, which would be Stage 2s, LV.Xs, and some Pokémon SP with low energy costs. If Expert Belt were to be reprinted, would it still see play? Unfortunately, not as much. Despite blending Giant Cape and Muscle Band in one card, Expert Belt is an incredibly risky card to play even if your deck didn’t use EX/GX Pokemon. One Pokemon that I can think of that can make effective use of Expert Belt would be Greninja BREAK decks, since 190 may be a tough number to OHKO except for few decks. Players can use Muscle Band to maintain the damage boost without giving up an extra prize, despite not giving the HP boost. This does not help non-GX Evolutions as much and still falls short of what EX/GX Pokemon are capable of even with Expert Belt, so that category is still underpowered. EX/GX Pokemon would not want to attach Expert Belt for fear of giving three prizes, and their HP scores and damage output is as good as it can be. If the Expert Belt user still cannot shift a 3HKO to a 2HKO, or a 2HKO to a OHKO, and if the HP boost still doesn’t shift from a OHKO into a 2HKO, or a 2HKO into a 3HKO, then they should drop Expert Belt and attach Choice Band. If your opponent is down to one prize left, well……then you got nothing left to lose due to your opponent taking three prizes, which is inconsequential at this point of the match. Which means that Expert Belt could be good at late game! In limited, if you pulled this, then you’ll definitely run it. All the Pokémon from the Platinum set seems underwhelming, and Expert Belt can help push your Pokémon’s performance even further! Conclusion: It pains me to give a negative insight of one of my favorite cards, but in reality, you can and will have better alternatives that aren’t as risky as Expert Belt in the present time. Back then, you didn’t have a choice in the 2009-2011 card pool. Today’s Throwback should look familiar for two reasons. First, we’ve reviewed it before. Twice. Second, it bundles three familiar mechanics, though we haven’t seen all three unified like this since. 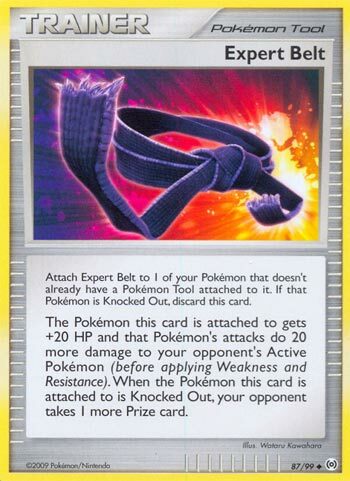 Expert Belt (PL – Arceus 87/99) is a Pokémon Tool with no attachment restrictions which increases both the HP and the damage from the attacks of the Pokémon to which it is equipped by 20. It even makes it clear that the damage increase is done to the opponent’s Active (so self-damage isn’t affected) and applies before Weakness/Resistance (where it can do the most good). There is a drawback, and it is a steep one, but it is also very straightforward; when the Pokémon to which Expert Belt is equipped is KO’d, your opponent takes an extra Prize. Officially released outside of Japan on November 4, 2009, Expert Belt would remain legal until the infamous “emergency” rotation that took place on July 2, 2011, due to the combination of rule revisions, releases, and re-releases breaking certain combos. Arceus isn’t just a Pokémon, but the last of the Platinum series of expansions. In was the end of an era, though some of us didn’t realize it at the time. The big mechanics of the previous Diamond & Pearl series of releases was the Level-Up mechanic, which contained Lv.X Pokémon; imagine Pokémon BREAK but as a fully realized and integrated game mechanic, like Pokémon-GX. The Level-Up mechanic was even combined with the next big thing, Pokémon SP, which were the focus of the Platinum series. After PL-Arceus, we received HeartGold SoulSilver which began the HS-series (and era) of the Pokémon TCG. It introduced Pokémon LEGEND, which were still better integrated than Pokémon BREAK but not by a whole lot, and were mostly a distraction (though I am fond of them). It maintained the rules and card templates of the previous era and didn’t look like it shook things up too much, but in hindsight, it appears this block was a carefully crafted transitional period. Pokémon LEGEND were a bit like clunkier versions of the Pokémon-EX we’d eventually receive, and Pokémon Prime helped prepare us for both the rarity and power of Pokémon-EX but also the general power spike we’d see with the BW-era cards. For those unfamiliar with Pokémon Prime, “Prime” wasn’t part of the name but was a rarity (I’m not sure if it was ever an official term). Along with Pokémon Legend, they filled the “Ultra Rare” slot that used to belong to Lv.X Pokémon and would (eventually) belong to Pokémon-EX and (presently) Pokémon-GX. Mechanically, the game didn’t distinguish between them and anything else, but besides the increased rarity over their counterparts, they would have better stats and effects. Stats and effects that would – again – start showing up on lower rarities in the BW-era releases. In the present, we’ve got Choice Band to provide anything with +30 damage while attacking Pokémon-EX/GX, Fighting Fury Belt to provide any Basic Pokémon with +40 HP and +10 damage, Giant Cape to provide anything +20 HP, Muscle Band to allow anything to do +20 damage, and Silver Bangle which your attack’s damage done to Pokémon-EX by 30 BUT couldn’t be equipped by Pokémon-EX. From its own time being Standard legal, we have Team Galactic’s Invention G-101 Energy Gain and PlusPower. Energy Gain could only be attached to Pokémon SP and reduced the Energy requirements of its attacks by [C]; not a damage boost but often able to fake it by allowing access to a more damaging attack for less Energy. Plus Power is not a Tool at all, but it is an Item that increases attack damage and was reprinted for the first time since Base Set 2 in Diamond & Pearl, then reprinted multiple times to keep it Standard legal until during this era (though it is only Expanded legal now). …and would be again today, if it was reprinted (even exactly as is). How about the modern Standard and Expanded Formats? Fighting Fury Belt doesn’t grant quite as much of a damage bonus but adds more HP and doesn’t have that nasty “extra Prize” clause. Fighting Fury belt also doesn’t much competitive play anymore, though at least it isn’t entirely gone; possibly, a reprinted Expert Belt would become the “Fighting Fury Belt” for one or two Evolutions that wish they had it, or some Basic that really needs +20 damage and +20 HP instead what Choice Band, Fighting Fury Belt, or Muscle Band offer. it doesn’t add enough for most Pokémon-EX/GX to risk giving up three total Prizes or single Prize attackers to jump up to two… unless you could make sure that the Extra Prize was the seventh or eighth Prize your opponent took, and thus meaningless. I would probably prefer a card inspired by Expert Belt, or else Expert Belt with heavy errata: the old bonuses don’t seem to be enough, yet I worry about beefing things up too much. Previous articlePokemon’s 1000th Episode Airs in the UK on Friday the 13th!